We’re always interested in getting your feedback on the content you’re interested in. You can now submit feedback for every page on the site. We’ll make sure to use this input to improve the content. So if there’s something missing, or if you like what you read, please let us know! Read on some of the newly added content. We’ve been hard at work adding more content these past few weeks. As well as improving the existing content, like the IRI documentation. Even more guides and examples are coming in the near future, but for now, be sure to check the new docs for Hub and for Compass. As always, we are more than happy if you contribute to our documentation. You can find all the content hosted on the documentation-markdown repository. See our contribution guidelines for more information on how to contribute. Support for suggesting specific changes to existing content. Further improving, and speeding up the search experience. Changing up labeling of existing content to be more accessible to new users. Building scenarios that run directly in the browser. So you can learn and try new things right away. Make sure you visit the new documentation portal! And thanks to everyone, especially our focus group, for their feedback during the development. A huge thanks goes to the development team that worked on this feature; Alexey Sobolev, Andrew Brough, Casper Eicke Frederiksen, Giorgio. E. Mandolfo, Lewis Freiberg, Max Appel, Jake Cahill, Marwen Trabelsi, Martyn Janes, Rihard Gravis, S. D. Nelson, and others in the IF! Please join the discussion in the #Documentation channel of the IOTA Discord server. 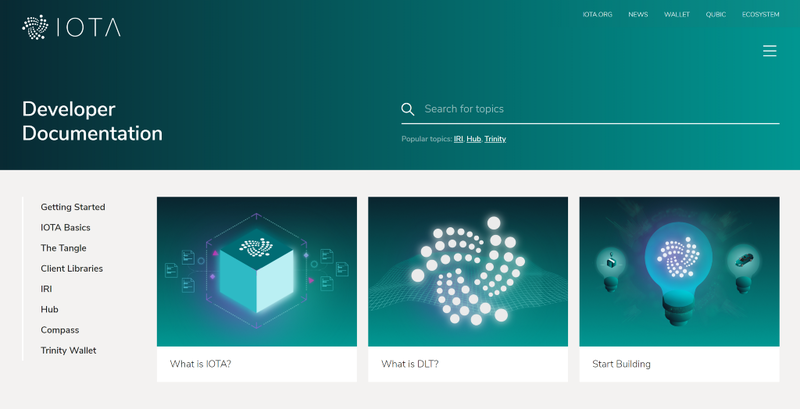 Welcome to the new IOTA documentation portal was originally published on https://medium.com/@jakubcech?source=rss-ada7b46e03f------2. The IOTA-News Community curates, examines, and summarizes news from external services while producing its own original material. Copyrights from external sources will be credited as they pertain to their corresponding owners. The purpose is to make use of 3rd party content or pictures as either allusion or promotional endorsement of mentioned sites. If you have a claim of copyright infringement with respect to material, please mail to support[at]iota-news.com. IOTA-News.com is a community run website and is NOT affiliated with the IOTA Foundation in any way.